Police agents are slammed for using violence against students and media professionals. Academics and general public back students. Students respond to president's overtures by increasing demands. 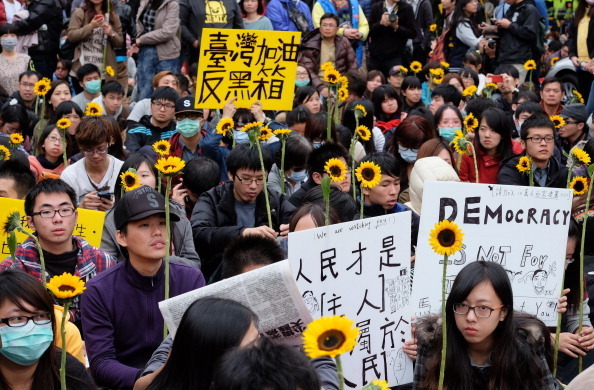 Taipei (AsiaNews) - Taiwan's sunflower student movement (太阳花 学运) continues stronger than ever. After students were cleared from the main government (Executive Yuan) building in the wee hours of Monday, a wave of criticisms has hit police for its treatment of the demonstrators. Two days ago, the Association of Taiwan Journalists (ATJ, 台湾 新闻记者 协会) slammed police for using force against media professionals. "The ATJ has received more than 10 cases of attacks on media reporters by the police during the student occupation of the Executive Yuan. The ATJ condemns the police for using violence against the media and violating the freedom of the press," a spokesperson for the association said at a press conference. "Prime Minister Jiang Yi-Huah (江宜桦) said he told National Police Agency Director-General Wang Cho-Chiun (王卓钧) to ensure the safety of reporters before they started crowd dispersal measures; however, the ATJ believes that this was a move to prevent newspapers and television stations from reporting the truth." As evinced by the images broadcast on television, the truth is indeed coming out. In general, police behaved correctly, but not all of them. For instance, some of the images show two police officers with white helmet in the back of the building who seem out of control as they beat anyone not moving away from the area. In another image, a police agent with black helmet is seen hitting a student in the face as he lies on the ground. In one case, a doctor is seen lying on the ground unconscious for several seconds after he was knocked out by some police officers before being rescued by others. TV stations showed students bleeding after they were struck in the face or the head. Families and student associations said they would take legal action against individual police agents, who can be easily seen in the images. The police chief justified his men's behavior towards journalists by saying that at "4:15 am, or a little before water cannons were used, we moved away all the journalists so as not to damage TV cameras and photographic equipment and allow them to see everything from a better and safer location." However, police behaviour boosted public sympathy for the students, who now enjoy greater understanding and support in the population. At the start of the week, the National Taiwan University (台大) Student Association went on strike to ensure that students are not penalised if they do not attend classes. The departments of sociology of Tsing Hua University (清华大学) and National Taipei University (台北 大学) decided to cancel classes in protest. As for the legislation and the pact's content, what most people reproach the government is its insistence in passing the trade agreement at all costs. Twenty-five professors in the Department of Mathematics at National Taiwan University wrote to the President in support of the students, expressing what probably sums up best the thinking of most Taiwanese. "We are not against the signing of the service trade agreement per se, since we do live in a world being swept by globalization, but the signing and review processes must be transparent and executed with due process. This is why we support what the students are demanding, which is rejecting any agreement signed 'in a black box,'" the professors said in their letter. Following calls from other political leaders, media, professionals, academia, Ma Ying -jeou (马英九) announced at the end in the day on Tuesday that he would talk with the students. The president invited student representatives to come to his office to talk "without precondition" about the problems and objections to the trade agreement. Initially, student leader Lin Fei-fan accepted the invitation. However, at a press conference together with the other leader Chen Wei-ting (陈 为 廷), he said that Taiwan needed new legislation to monitor all trade agreements with the mainland, and only then would it be acceptable to discuss the Cross- Strait Trade Service agreement (两岸 服务 贸易 协议). Students want legislators to push for the passage of monitoring legislation before the pact is deliberated, and that the Legislature's Procedure Committee was not to boycott the proposals related to the law. Afterwards, on Wednesday, Lin Fei-fan temporarily turned down the president's call for talks because students no longer trust him and his promises. At yesterday's press conference, Lin Fei-fan finally said that the occupation of parliament would continue until the students' aims were achieved.